Your favorite actor named Nathan seems to be teasing something about your favorite adventurer named Nathan, but it may not be the Uncharted movie announcement you'd expect. Nathan Fillion, best known for his leading roles in Firefly and Castle, has posted two separate images to his official Instagram account that should spark the imagination of Uncharted fans. The first is an image of rapper (and surprisingly decent Fortnite player) Drake, accompanied by the caption "Sic Parvis Magna. 7/16/18." Fillion probably isn't just showing his love for Drake's new album. Taken with that "Sic Parvis Magna" caption, the Latin motto of Sir Francis Drake and adopted slogan of Uncharted hero Nathan Drake, it definitely seems to be teasing something about the action adventure series. Or… maybe just Sir Francis Drake? But then Fillion put another image of his Instagram that pretty well seals it. That's a modern map of Malaysia - with the magnifying glass placed around the region of Kuala Lumpur - and a very familiar leather-bound notebook full of familiar archaeological sketches in the background. This time the caption simply reads "7/16/18". 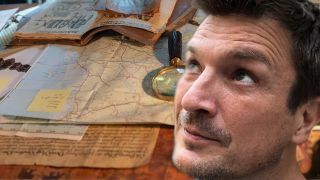 Being chiefly a screen actor (though he's also done some great voice work as Destiny's Cayde), you might conclude that Fillion's teasing a role in the long-in-development Uncharted movie. Maybe as the older, modern-day counterpart to Tom Holland's young Drake, or perhaps even Drake's charming mentor Victor Sullivan? Insider sources cited by Variety poured some cold water on our newly resurrected dreams of Nate as Nate: according to them, Fillion has nothing to do with the movie. It could be that Variety's sources are just out of the loop, but for now it might be best not to get your hopes up too much on the cinematic front. Personally, I'm hoping for some new Uncharted 4 DLC that replaces every vocal performance with Fillion. Or maybe another standalone expansion like Uncharted: The Lost Legacy, starring Fillion as an all-new treasure hunter? But then why put up a picture of Drake specifically… hm. July 16 is Monday, so at least we won't have to wait to long to find out whatever Fillion's teasing. If you're still hoping for more movie news, check out 6 essential lessons the Uncharted movie needs to learn from the games.